The peaceful, barefoot-chic of Anguilla is what many worldly travelers seek on a vacation to the Caribbean. The island is certainly an excellent place to relax and escape the daily grind, or cold, and it offers travelers a unique and elegant charm all its own. Located in the Leeward Islands of the West Indies, east of Puerto Rico and the Virgin Islands, Anguilla’s history and heritage is British. Getting to Anguilla from the U.S. or Canada is fairly easy, with visitors typically flying to St. Maarten and then taking a short ferry ride across to the island. While relaxed, this is an island that certainly has an exclusive feel and caters to a more upscale traveler. It draws celebrities and jet-setters, though it lacks the paparazzi or glitz factor you might encounter in other upscale, international destinations. Like the Dominican Republic and other islands in the Caribbean, Anguilla definitely has peak travel seasons, and pricing will fluctuate throughout the year. If you are able or interested in traveling during the spring and summer months up until Thanksgiving week in the US, you will likely find very attractive price points and sometimes even incentives such as free nights and breakfast. So who should think about renting a villa in Anguilla? Basically, if you demand and expect the finer things and quiet, pristine beaches, but not the see-and-be-seen culture found at many other upscale destinations, Anguilla is for you. We asked our Anguilla specialist to list some of the selling points of the island and the hybrid villa-resort, CeBlue. When you rent a villa at the CeBlue Resort, what are some of the available services that most guests enjoy or take advantage of the most? A. Many of the guests who stay at a CeBlue villa opt for a private chef to come in an cook meals. It’s a great service and people are able to create a romantic meal for an anniversary or even a generous spread for up to 60. Also, most guests take advantage of on-site spa services at The Blue Spa, which can often be enjoyed while overlooking azure Caribbean Sea. The location and setting foster deep relaxation. Also, because the property offers many resort-like services, guests will often enjoy a nightcap, complemented by the relaxing sounds of acoustic guitar, at The Blue Bar. Finally, another popular activity is enjoying a morning cruise aboard the resort’s very own boat to snorkel and explore the marine life along the nearby coastline. A. There are several complimentary services that guests enjoy including a welcome cocktail and cool-down towel, beach attendant transfer to CéBlue Beach Club, daily access to CéBlue Beach Club (beach chairs, umbrellas & towels provided), a state-of-the-art fitness center, a kid’s game room (with table tennis, air hockey & video games), free parking and WIFI property-wide. What do people seem to enjoy most about CeBlue? A. CeBlue epitomizes modern living, with crisp, earth tone décor, stylish furnishings and enviably elevated panoramic ocean views of Crocus Bay and a secluded 5,000 foot long beachfront. How does it differ from other resorts on Anguilla? Can you speak to the security of the villas and the resort? A. There is 24-hour security surveillance present and 24-hour resort manager service. Are there doctors or medical staff on site or nearby? A. A doctor on call is available seven days a week. What is the most popular time of the year for renting a CeBlue villa and how far in advance should people think about booking them? A. CeBlue is exclusive and very limited with just eight luxurious villas. For travel during peak travel periods, meaning basically Thanksgiving through May, plan to book ahead at least 6 months out, with Christmas and New Year’s requiring an even longer booking window. 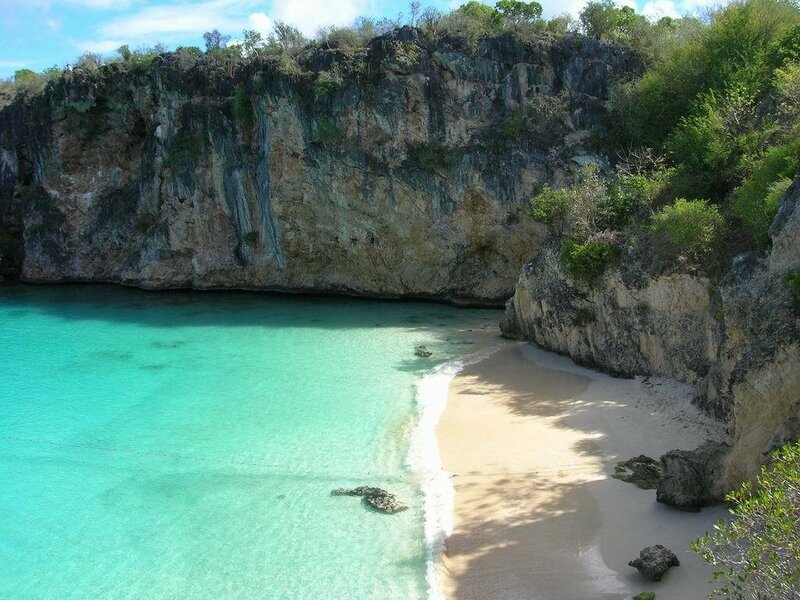 How easy it for U.S. and Canadian travelers to get to Anguilla? A. U.S. and Canadian travelers enjoy year-round direct flights to SXM in St Maartin, with an easy sea shuttle transfer to Anguilla (just 20 minutes). Take a tour of all of our CeBlue Villas in Anguilla today!